Hyundai’s Ship Building Division (HHI-SBD) has finalized a contract for two Suezmax tankers for Turkish shipowner, Ditas Shipping. The 158,000-cubic-meter crude-oil tankers will each be powered by individual MAN B&W 6G70ME-C9.5 two-stroke main-engines that feature integrated Exhaust Gas Recirculation (EGR) systems. 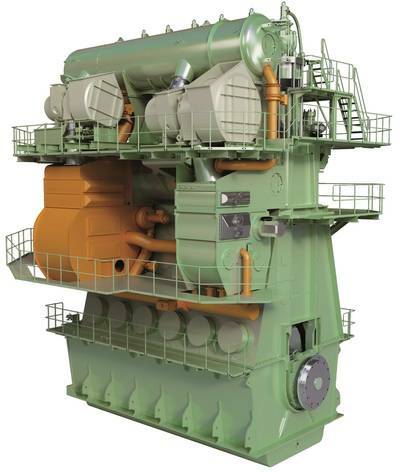 While there are already IMO Tier III-compliant vessels with EGR systems in service, the Suezmax newbuildings will be the first vessels with keel-laying after January 1, 2016 to be officially certified as complying with Tier III emission restrictions within existing North American NOx Emission Control Areas (NECAs) and the United States Caribbean Sea NECA. Operating-Principle A part of the exhaust gas is drawn through a scrubber, cooler and water mist catcher by suction created from an electrically driven, specially designed blower. The blower raises the pressure of the exhaust gas, which is then mixed with the charge air via a unique charge air pipe, before entering the main-engine coolers. Within the scrubber, the exhaust gas is washed with water, which consequently becomes acidic depending on the sulphur from the fuel in the exhaust gas dissolving in the water. Sodium hydroxide dosing is therefore required to neutralize the acidic scrubber water. In addition, the scrubber washes out particulate matter (PM) that becomes suspended in the scrubber water, and it is therefore necessary to have a water treatment system (WTS) to remove PM from the scrubber water, and discharge the PM as concentrated sludge into the sludge tank on the vessel. The WTS is designed for cleaning the scrubber water to such an extent that it can be discharged into open sea. Following efficiency optimization trends in the market, MAN Diesel & Turbo thoroughly evaluated the possibility of using even larger propellers and thereby engines with even lower speeds for the propulsion of tankers and bulk carriers. Such vessels may be more compatible with propellers with larger diameters than designs so far used, and therefore able to facilitate higher efficiencies following adaptation of the aft-hull design to accommodate a larger propeller. It is estimated that such updated aft-ship designs with the G-series of engines offer potential fuel-consumption savings of some 4 to 7 percent, with a similar reduction in CO2 emissions.